Live for the Outdoors is the website of Trail Magazine and Country Walking Magazine – Britain's two best-selling monthly walking titles. Whether you're into hillwalking, mountain climbing, gear, historic walks, gentle strolls or simply enjoying the outdoors from the comfort of a chair, the team behind these magazines have between them some of the most knowlegeable minds in the outdoors! Feel free to get in touch: we'd love to hear from you. Oli’s back for his second spell at Trail, this time as editor, because he can’t get enough of the magazine and the UK mountains. He’s walked and scrambled everywhere from the Dales and Dartmoor to the Cuillin Ridge and the Alps, but he’s never happier than peak-and-pub-bagging in the Lakes. Jenna, Trail’s fearless deputy editor, has been in love with the mountains since climbing The Old Man of Coniston 15 years ago and the Lake District is still her favourite place in the world! Please get in touch with any Mountains for the Mind related enquiries. 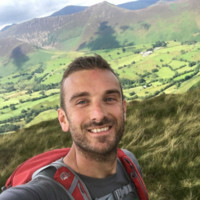 Ben is an article writer, gear reviewer and photographer with a particular fondness for scrambling in pointy rocky places (would move to the Dolomites if his wife would let him). Get in touch with ideas for magazine features, new exciting gear our readers need to know about, or any general mag related queries. Jake is the youngest writer on Team Trail. His responsibilities include contributing features, editing the Know How section and overseeing Twitter and Instagram for the magazine. He also loves a wild camp, so when not in the office you’ll find him holed up in a bothy, tent, hammock or bivi somewhere in the great outdoors – likely slurping hot chocolate and munching on a Toffee Crisp. Got a question about skills for the hill? Get in touch, and say hello! Trail magazine's gear tester for over 25 years, Graham Thompson's assessment of outdoor gear is the most influential in the industry. Based in England's Lake District, you can trust his opinion – and it is that opinion that forms the backbone of LFTO's best-in-the-business gear reviews. Guy is in charge of Country Walking magazine. He's been a walker since being dragged up the Lake District's 100 highest peaks as a nine year old. He once backpacked from John o'Groats to Lands End. He never cleans his boots. Nick writes features, news and gear reviews for Country Walking, so feel free to contact him about any of those. He's been into this stuff ever since his folks dragged him along the South Downs Way aged five, and he knows a ridiculous amount about the Peak District. have an idea or know a spectacular walk that you'd love to see in Country Walking, do get in touch. Pip is Country Walking’s staff writer, routes editor and all-round gear geek. Partial to wanders in the West Country as much as peak bagging in the Lakes, he walks all over Britain and occasionally strays further afield.